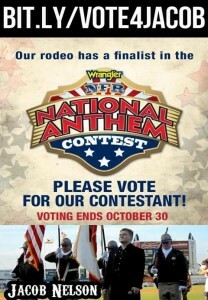 Vote Jacob Nelson to sing National Anthem at NFR! Jacob Nelson was nominated and has made it into the TOP 4 for his category to sing the National Anthem at the National Finals Rodeo in Las Vegas (Rodeo’s Super Bowl!) It is national (actually they reach international) and we need all the votes we can get! Jake was born and raised in our valley, has always lent his voice to charity organizations, and has always been a proactive member of our community. PLEASE VOTE FOR JACOB! Editor’s Note: Learn more about entertainer, pilot, entrepreneur and Antelope Valley resident Jacob Nelson at http://jacobnelson.com/bio/. View Jacob’s rendition of the National Anthem in the video above.